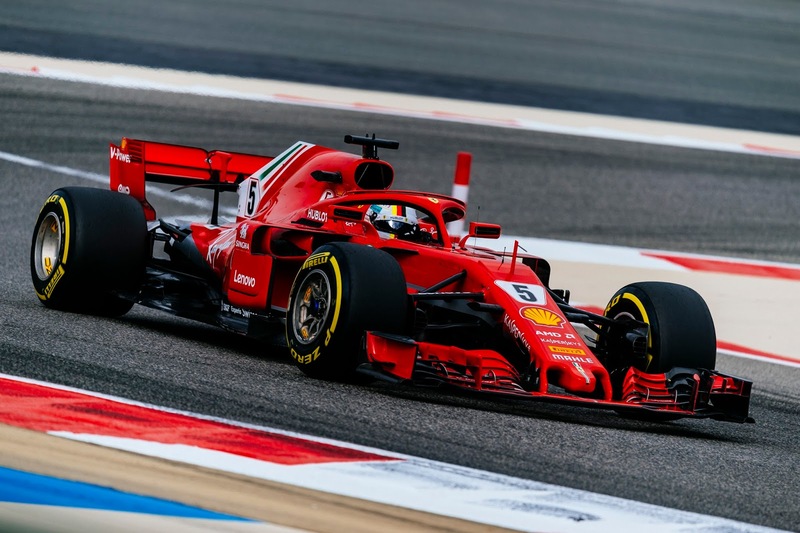 FP3 is always unrepresentative in Sakhir due to the massive temperature change from afternoon to twilight, but it looked clear that the diva had broken loose from her restraints in Mercedes, with neither Bottas nor Hamilton looking as on it as Ferrari and Red Bull. Add a 5 spot penalty for Lewis for a trashed gearbox from Australia (hydraulic leak during race) and the pressure was entirely on Bottas for qualifying, along with the wildy misnomered "party mode" of the Brixworth PU, which is actually just their qualifying mode. Cooler temps should aid Mercedes, but the fact of the matter is that they seemed to be struggling more at this track than at Melbourne. The real battle of interest in qualifying of course is the last 4 spots in Q3, with Macca, HAAS, Renault AND Toro Rosso all making themselves seem that they had a real shot at it. 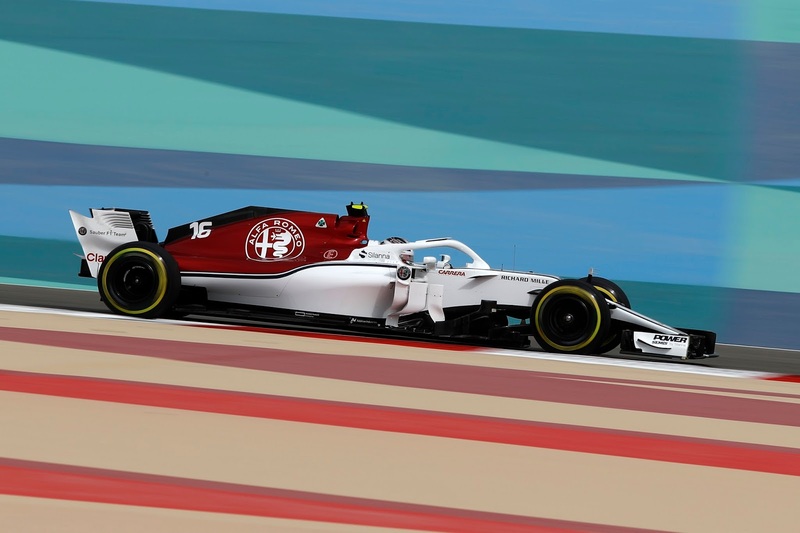 Williams managed to look even worse than in Australia, tragically and for a brief moment yesterday, Sauber had a bit of relevance. FP3 also featured a loose and cracked sidepod deflector for Vettel, another moment of instability for the would be team leader. A new floor has improved his mood, but unlike his teammate Seb still seems to be getting to grips with the handling characteristics of his new ride. Green Light!! Brave Sir Marcus was first to test the twilight, followed by his erstwhile teammate and squire, Leclerc. Hartley was next to emerge and with 90 seconds already off the clock, it looked that the top teams would be holding fire till the whites of their eyes was the chosen strategy, as lower temps and track evolution would favor those who could start their last lap closest to the chequers. 13 minutes left and Ferrari was on track with Magnussen lighting the track purple, crushing all the sectors for a 1:30.03. Hartley radioed in a damaged front wing, of the new spec, which was not going to help his cause at all. 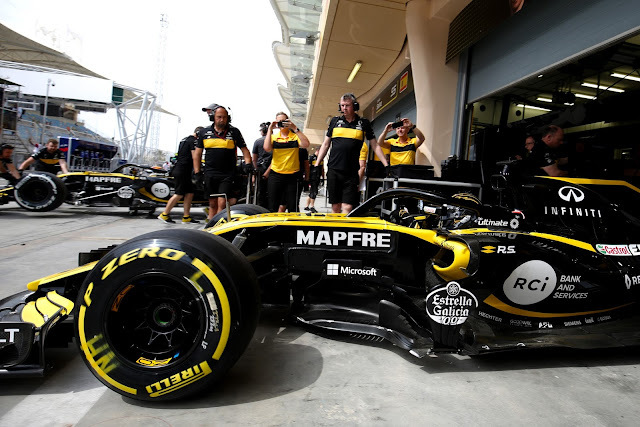 Tyre strategy for the top teams was Mercedes and Ferrari running Softs, save Hamilton running Supers no doubt to save an extra set of Softs for his race, as with his penalty and running in traffic extra Softs to choose from will be more important for his race strategy. No surprise, Raikkonen ahead of Vettel ahead of Bottas on the Softs, with Kimi rocking a 1:28.951 to take the early lead. A surprise P4 for Lewis on the Supers, 1:29.396 not at all a good result. As immediately demonstrated by Verstappen outdoing him for P4 on the same compound. Big mess for Grosjean on his first run, lurid replay on telly while KMag stuck it in, best of the rest in P7 with 6 minutes left. AND THEN VERSTAPPEN PUT IT IN THE WALL. Magnificent error as he has thoroughly crushed the front of the car into the tyrewall. On replay, it looked like a rear suspension failure, between T2 and T3, although that awaited confirmation from Red Bull. Verstappen later clarified that he picked up an unexpected 150bhp boost which spun up the tyres and sent him round. Update on Hartley's wing was a bird strike caused the damage. Shame he wasn't playing in the Masters instead of racing, a bird(ie) there would'be done him a bit more good. With 5:25 frozen on the clock, it was Grosjean, Alonso, Sirotkin, Leclerc and Stroll in the dropzone with Ericsson in the hotseat. But all the teams wanted that last spot and the track went green to thunderous silence. 3:30 to go, and off they went, Hulkenberg leading the way for Sainz. Done like a dinner, Grosjean, Ericsson, Sirotkin, Leclerc, Stroll, off to sip Virgin cocktails and indulge in their regrets. The rest turned it round for the start of Q2, with Gasly the biggest surprise, going P9 in the first of the qualifying sessions. Hartley was on pace to achieve a similar result till he borked his wing, Honda looking a bit feister than most predicted. The start of Q2 was a whole lot of nothin', the track devastatingly silent for nearly 2 minutes before Vettel shattered the silence and kicked the session properly off. Sainz, Raikkonen, Hulkenberg and pretty much everyone else followed on. All the runners rocked the Supers, no tyre strategy games save Hamilton who was betting the farm on the Softs, which seemed to have been the better for his car throughout the event. Just past the 10 minute mark and Vettel threw down the gauntlet, unmatched by Raikkonen, nearly 0.2 seconds off. Bottas had apparently followed Ericsson into the sea as he was 0.65 seconds slower than Vettel on the same tyre while his teammate on the Soft tyre went P2 just a tenth off. Gasly P6!!! Hulkenberg, Magnussen, Sainz and Ocon (the extra spot vacated by Verstappen aiding the Force India) filled out the top 10 with Perez just being on the outside looking in, having run out of ERS before the end of his lap. Into the garage they went to prepare to joust at the ultimate glory of Q3. 4 minutes left and off went Hulkenberg, again with Sainz behind him, Gasly trailing the pair. Hamilton was last out just in front of Hulkenberg rolling on his hot lap. Supers for Lewis this time. Hulkenberg to P6 Vandoorne, Alonso, Gasly and Magnussen crossed the line tenths apart, just after the chequers fell with neither Macca making Q3. Magnussen to P7, Gasly P9 and Ocon just hung on by his fingernails to P10. Hartley improved to P11, first of those failing to make Q3 by a painful 0.086 seconds. Perez, Alonso and Vandoorne rounded out the rest, with Verstappen frozen in P15 due to his earlier, spectacular, mishap. Off to drown their sorrows in machboos and muhammar as the rest got ready to have a go at the palmares. Q3 started with Sainz and Gasly, followed fairly closely by Ferrari, Mercedes and Red Bull. Sainz to the top first, naturally, as he was first out. Vettel ran wide at the last turn on his run opening the door for Raikkonen who took top spot. 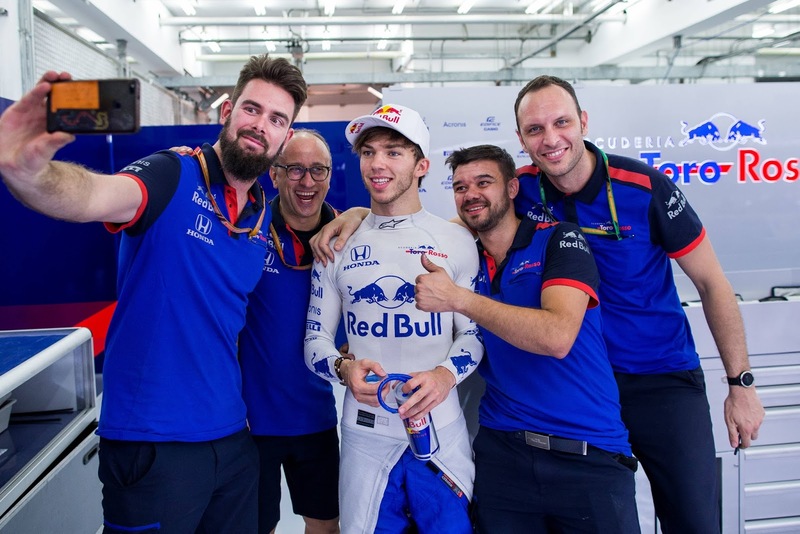 Gasly outpointed Sainz, as the rest of the midfield in Q3 remained in the garage for the first runs. Hamilton's best was just P3, a tenth off the 1:28.101 of Kimi on provisional pole. Bottas took P4 and Ricciardo P5 to complete the sharp end. To the pits for the rapid turn around they went, the track falling silent as all the excitement was now confined to the frantic work of the mechanics. 3 minutes to go and out went Hulkenberg, with, quel surprise, Sainz behind him. Ocon and Gasly were next to commit to the joust, then Magnussen and Bottas. 2:20 to go and Hamilton joined the fray, Vettel, Ricciardo and Raikkonen rounded out the order as Hulkenberg rocketed past on his last shot at glory. Early days Hulk looked to be quicker than Sainz, an advantage he maintained through the first 2 sectors. Then it was all tossed over as the sharp end got it into gear. It was Bottas, who took the first sector by storm, that caused the immediate fuss, purple lighting up the board as the Ferraris gave chase. Vettel up on Raikkonen as Lewis had no improvement Bottas P2 with Vettel taking pole. Ricciardo stayed P5 and as Raikkonen completed his run he failed to do it, but did manage to dislodge Bottas from P2, Ferrari front row lockout giving the tifosi all the feels. Bottas' second run doomed Hamilton to start P9 and his weekend of woe continued unabated. But it is the staggering run of Gasly (words I did not foresee writing) in P6 that has all the heads shaking. With the penalty to Hamilton, that's the highest start Honda have had for a dry qualifying session since they rejoined the sport. With McLaren bogged down in 12th and 13th, expect the hay to be made soon. 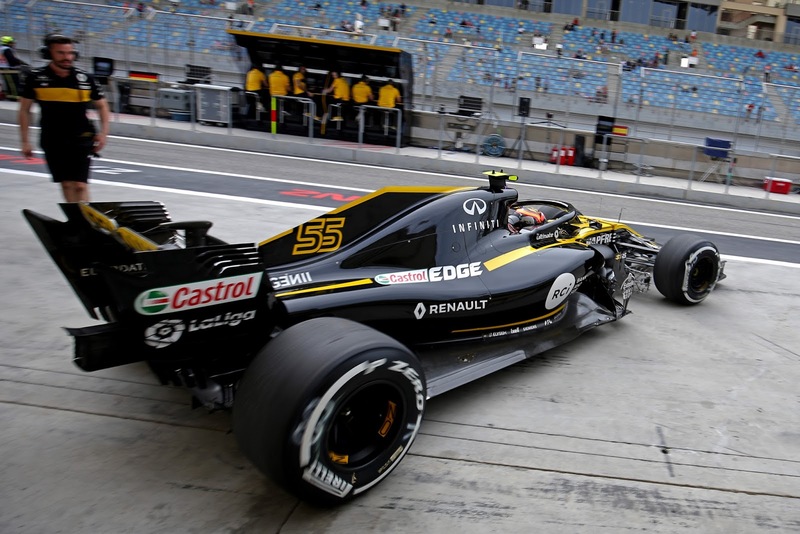 And with Renault and Red Bull both there, alternate targets for criticism are looking few and far between. 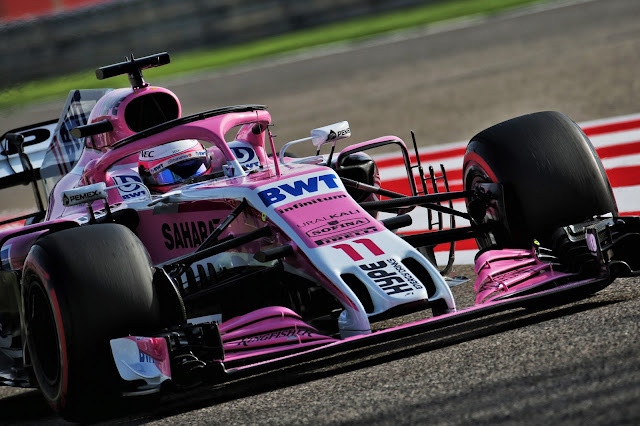 Also making waves with post session comments was Lance Stroll as the dumpster fire at Williams continues unabated. Having apparently taken lessons from Alonso last year, he was brutal in his criticism of the car and its handling.